Can’t decide between the 2018 Volkswagen Beetle and the 2018 MINI Hardtop 2 Door? You’ve come to the right place! 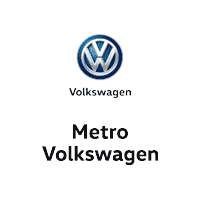 We at Metro Volkswagen have put together this detailed comparison to help shoppers near Irving, Grand Prairie, Grapevine, and Dallas make this exciting decision. In this comparison, you’ll see how the VW Beetle vs. MINI Hardtop stack up against each other when it comes down to performance, interior space, and technology. Let’s get started by getting under the hood and seeing what makes these two models go! Leading the way under the hood of the 2018 Volkswagen Beetle is a 2.0L TSI® 4-cylinder turbocharged engine. This engine works alongside a 6-speed automatic transmission with Tiptronic® and Sport mode. This vehicle’s engine is also equipped with an intercooler and direct fuel injection, helping the VW Beetle manufacture an impressive 174 horsepower and 184 lb-ft of torque. As for the 2018 MINI Hardtop 2 Door, you’ll have a 1.5L 3-cylinder engine leading the way. Although this engine also works with a 6-speed automatic engine, it only boasts 134 horsepower and 162 lb-ft of torque due to its lack of extra sporty equipment and a fourth cylinder. Additionally, the Cooper’s engine requires premium gasoline; not only will you not get the same high level of power as you will in the VW Beetle, but you’ll also have to shell out more money every time you go to the gas station. Not only will you and your passengers have more space in the Beetle—you’ll also have more space for your things! 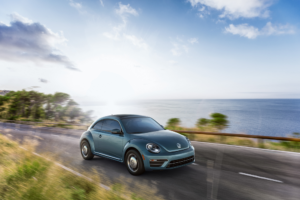 With all the seats in place, the VW Beetle offers 15.4 cubic feet of cargo space. The MINI Hardtop, on the other hand, offers just 8.7 cubic feet of cargo space, meaning you’ll have to leave some things behind or sacrifice a seat or two. The interior of the 2018 Volkswagen Beetle isn’t just spacious and comfortable—it’s rich in all the latest technologies as well. Inside this model, you’ll have a Composition Media 6.3-inch touchscreen infotainment system with Bluetooth® connectivity, smartphone app integration via Apple CarPlay™ and Android Auto™, and an intuitive navigation system. 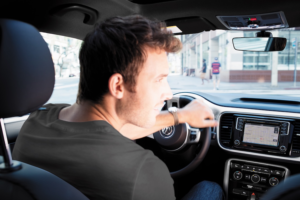 Plus, the navigation system in the VW Beetle doesn’t stop at turn-by-turn directions—it also provides you with real-time updates about your route, keeping you in the loop about traffic and weather on your way to your destination. As if that weren’t enough, this intelligent system can also provide you with information regarding the scores of your favorite sports teams, movies playing near you, and gas prices, all via the SiriusXM® Traffic and SiriusXM Travel Link® features. You’ll get some of these features in the 2018 MINI Cooper as well; however, you’ll completely miss out on the SiriusXM® Traffic and Travel Link® systems. 2018 Volkswagen Beetle vs 2018 MINI Cooper: Which One? As you can see, the 2018 Volkswagen Beetle comes out on top in every category. Now that you’ve had a taste of what this impressive vehicle can do, it’s time to get behind the wheel and experience it for yourself. Shoppers near Irving, Grand Prairie, Grapevine, and Dallas should give us a call at Metro Volkswagen today to schedule a test drive!